Do you have a goal you want to accomplish? A new strategy or business process? A life change you want to make in your personal life? Are you keeping that goal locked away in the back of your mind instead of sharing it with others? Let’s accomplish our goals together! 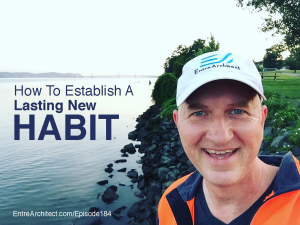 This week on EntreArchitect Podcast, How to Establish a Lasting New Habit. Maybe you’re listening to this podcast in a transitional season: from one season to another, out of a vacation and back into your regular routines, back to school, or otherwise. 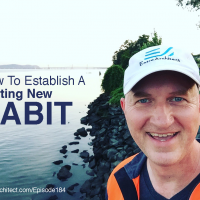 Recently, Mark began a project to figure out how to live a healthier lifestyle and wrote about it in a blog post: 10 Simple Steps to Develop a Lasting New Habit. It’s not hard to establish bad habits. Mark could roll out of bed and into his comfy computer chair, where he could stay the whole day. Instead, he wanted to create a new, healthy lifestyle. As the summer got started, Mark decided to make some new commitments. Over the last 10 weeks, he has worked through a process to create a healthier lifestyle. In the past, Mark has tried to establish healthy habits like meditation and running with little success. So why now? Mark is ready to create a healthy lifestyle, a mindset shift, and a way to integrate this lifestyle into his identity. Your new habit should be something that is hard to fail. We have so much going on, and if things are too complicated, you’re more likely to resist the change. For Mark’s 10X Project, he created a simple goal: each day do 10 minutes of stretching, 10 pushups, 10 crunches, walk for 10 minutes, run for 10 minutes, and meditate for 10 minutes. For Mark, the 10X in the name 10X Project is not only a reference to the quantities of 10 used through the exercises, but is also a reference to the improvement I may experience when I accomplish my goal. Can I improve my health by 10X with a lasting new habit? Will this new habit lead to other habits that may improve other parts of my life? In the past, Mark has often created ambiguous goals. This time, his goal was clear: each day do 10 minutes of stretching, 10 pushups, 10 crunches, walk for 10 minutes, run for 10 minutes, and meditate for 10 minutes. If he could establish that within 10 weeks, then hopefully the habit will lead to a healthier lifestyle down the road. What are you going to do? How and when are you doing to do it? Create some structure. Determine what you’ll do if you miss a day. In a journal, Mark tracked his progress through the days and weeks to reach his goal. You could also track using your personal calendar or an app that works well for you! Usually we don’t like being held accountable, but it’s clear that accountability works. We’re more likely to achieve our goals by sharing our plans. Mark posted his 10X Project for all of his readers and continued to post on social media on occasion. When Mark started the 10X Project, he was in a transitional time with a different schedule and timing. Because of his family commitments, he had to be up early in the morning anyway. Why not use that time to start cementing a new habit? After Mark completed his daily tasks to reach his goal, he’d grab breakfast and watch the sunrise over the Hudson River. It was incredible motivation for him to continue on his journey. Did you reach your goal? Time to celebrate! This podcast is Mark’s celebration of his 10X Project. He’s made it through all 10 weeks, five days a week. The best part about the consistency is the motivation to continue. Mark has established a new habit, and he’s ready to push forward to continue creating a healthy lifestyle. Question: Did establish a new habit? Do you want to? Visit the The EntreArchitect Community Facebook Group and share your plan!